We recently attended the 2017 Oxford Global Health and Bioethics International Conference, aimed at promoting multidisciplinary and inclusive discussion of critically important ethical issues in global health. We were excited about several issues pertinent to health policy and systems research ethics discussed during this excellent meeting. The importance of health system strengthening was highlighted right from the opening keynote of the Oxford Global Health and Bioethics International Conference. Devi Sridhar in her talk ‘Governing Global Health: Who Runs the World and Why?’ emphasised that power in global health governance lies with three main actors—the United States, United Kingdom, and the Bill and Melinda Gates Foundation. Several high-profile attendees commented on the distinction between technology or disease-focused versus systems-focused approaches, and asked how donors can be incentivised to be more systems-focused. They also raised concerns about “reverse priorities” where health systems are a central focus in high income countries (e.g. Obamacare and the UK National Health Service), but relatively neglected for Low- and Middle-Income Countries. Power, politics and equity were thereby raised as critical ethical issues in global health; issues that were also central concerns in the 2016 Health Systems Symposium. Jeff Khan in his keynote ‘Ethics on the horizon: A proposal for a future-facing global bioethics’ included health systems research ethics in his list of priorities. He also had two suggestions that we think are especially relevant for the emerging field of health policy and systems research ethics. First, that global bioethics should make far greater use of existing global health ethics frameworks such as Benatar, Daar, and Singer’s that emphasise values such as solidarity, equity, democracy, and sustainability. We agree, and have regularly referenced this framework in our own HPSR materials. Second, he suggested ethicists practice more “embedded ethics”. Reflecting on this, we understand embedded ethics could come in a variety of forms. For example, Bridget is an ethicist co-located within an ethics institute and a global health institute, and Sassy is a social scientist studying ethics issues as part of several multi-disciplinary research projects and on behalf of the institution she is part of. Being a co-located ethicist or social scientist can be invaluable in ensuring there is regular, open and honest dialogue and deeper learning between ethicists and health policy and systems researchers. Ethics issues can potentially be identified and responded to more efficiently and effectively. However, there are potential challenges: ethicists’ foci may be shaped by the research they are linked to, and they may lose objectivity and the ability to be critical of the studies or institutions they are part of. We have already begun to reflect on some of our embedded work, and would value ideas and experiences from others. The meeting closed with keynote presentations given by three inspiring women: Ruth Macklin, Florencia Luna and Maureen Kelley. Maureen Kelley presented last, giving a rich example of an international collaboration conducting diverse forms of embedded ethics research. That research aims to feed into policy and practice and conceptual thinking on a hotly debated topic in bioethics: vulnerability. The collaboration takes forwards conceptual work by Luna and others who have argued that vulnerability should be understood as a layered conceptrather than a label given to sub-populations . 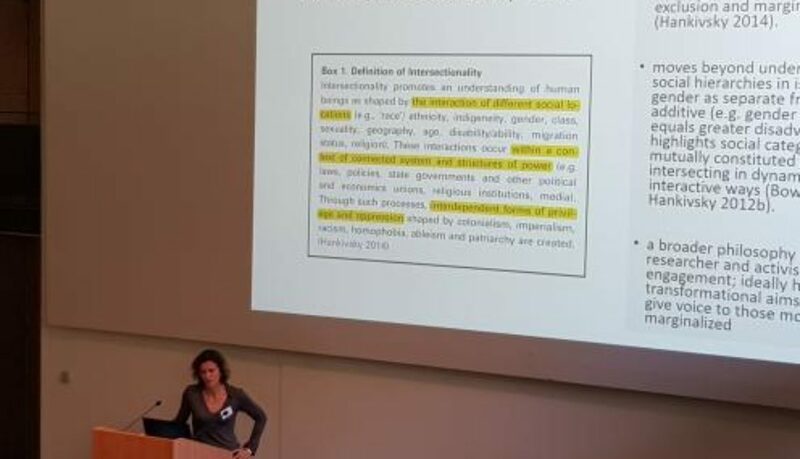 We were struck in Luna’s presentation with some overlaps in her conceptualisation of vulnerability with intersectionality analysis in other fields and with concepts of systematic/corrosive disadvantage from philosophy. We had described intersectionality analysis earlier in the meeting when introducing the partnership for research on gender and ethics (RinGs). Moving forwards, we think it would be exciting to see how Luna and others’ ideas on vulnerability and disadvantage might feed into our intersectional analyses in RinGs, and consider whether an intersectional lens could enrich our reflections in RinGs and the ethics TWG at HSG on embedded ethics, vulnerability, resilience and empowerment. Watch this space (or, ideally, fill it!). ReBUILD and RinGs are delighted to invite you to our event, Building Better Back. At the event we will discuss gender and health systems in post-conflict and post-crisis countries. The meeting will launch our new online resource and be an opportunity to find out more about post-conflict health systems reconstruction in Mozambique, Northern Uganda, Timor Leste and Sierra Leone and discuss the implications of reconstruction in these countries for other settings. Open invitation to join a Tweet Chat at 16.00 GMT on Friday 6 February. We are particularly keen that those of you working on gender and health systems in post-conflict and fragile settings have your say. “Filling the void: Health systems in fragile and conflict affected states” series was launched in Conflict and Health, in collaboration with the Thematic Working Group on Health Systems in Fragile and Conflict Affected States. Healthcare in fragile and conflict affected states remains critical and this series aims to provide evidence on health policies and programmes that work in fragile or conflict-affected situations. The series launched in November and has a growing range of articles touching on various aspects around health systems in fragile and conflict affected states. For a chance to have your say, join us @Conflict_Health and the prominent group of researchers involved in the discussion including Tim Martineau (@TimMartineau), Suzanne Fustukian (@IIHD_QMU), and Maria Bertone (@mpbertone) on 6 February 2015 at 16:00 UK Time. If you are not able to attend the live discussion, please feel free to tweet your comments to @Conflict_Health using the hashtag #HSRFCAS. An edited summary of the Twitter-chat will be published in a Storify post shortly after the session. If you haven’t done so yet, we also invite you to join our LinkedIn group, where more discussions on the topic on health systems research in fragile and conflict affected states take place. This blog was first posted on the BioMed Central site. 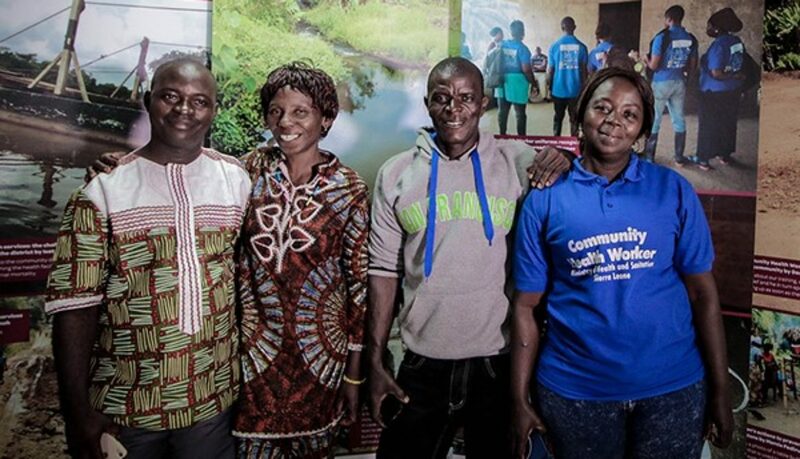 From press headlines, television debates and online commentaries, the whole world seems to have understood the significance of building strong and resilient health systems given the recent catastrophic events occurring in Sierra Leone, Liberia and Guinea. But how does gender play a role in health systems reconstruction and how might a gendered lens make health systems more robust after conflict? Estimates by the World Bank suggest that by 2015 just under one third of the global population will live in conflict-affected settings. At the same time, cross-national quantitative analysis suggests that states with higher levels of gender equity exhibit lower levels of violence in international crises, and are less likely to initiate the use of force. Despite this, the health systems literature does not sufficiently address the issue of gender equity, let alone in conflict-affected and post-conflict settings. A paper we have recently published in Conflict and Health explores this very issue: how health systems can best integrate gender equity considerations during this important post-conflict period. Our paper set out to explore if and how the rebuilding and reform of health systems in conflict-affected and post-conflict contexts addresses gender. We used the six WHO building blocks as a way of framing our findings, so we explored available literature on gender equity aspects of 1) health service delivery/provision, 2) human resources, 3) health information systems, 4) health system financing, 5) medical products and technologies, and 6) leadership and governance. Using this framework we reflected on the key components of a gender-equitable health system that should be considered as part of health system reform in conflict-affected and post-conflict states. A key area of action in the development of human resources is to address gender disparities in advancement, planning, retention, supervision and remuneration across all areas of the health workforce. 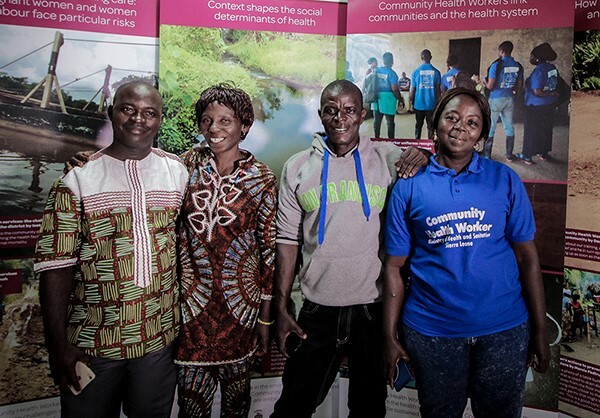 In the critical area of health financing there is a need from a gender perspective to pay more attention to those working in the informal sector; to move to public financing mechanisms, to enrol entire households, not simply male ‘breadwinners’, to include comprehensive sexual and reproductive health services, and to prohibit exclusion due to pre-existing conditions, which may particularly affect women. And in the area of leadership, that there should be more input from gender advocates to ensure that gender-specific health needs are considered in the governance of health systems. We argue that this is particularly relevant to post-conflict settings, where greater opportunities for social reform – such as promoting the advancement of women to health leadership positions – often exist. Why did we focus on gender? The paper in Conflict and Health describes how we explored the literature, but in our broader report we also undertook desk studies of gender equality and equity in health system reconstruction in four countries, Timor-Leste, northern Uganda, Mozambique and Sierra Leone. But why did we choose to focus on gender equity in the rebuilding of health systems in these settings? Especially as fragile health systems require transformation in so many areas and with many structural and social factors taken into consideration – why was gender so important to us? 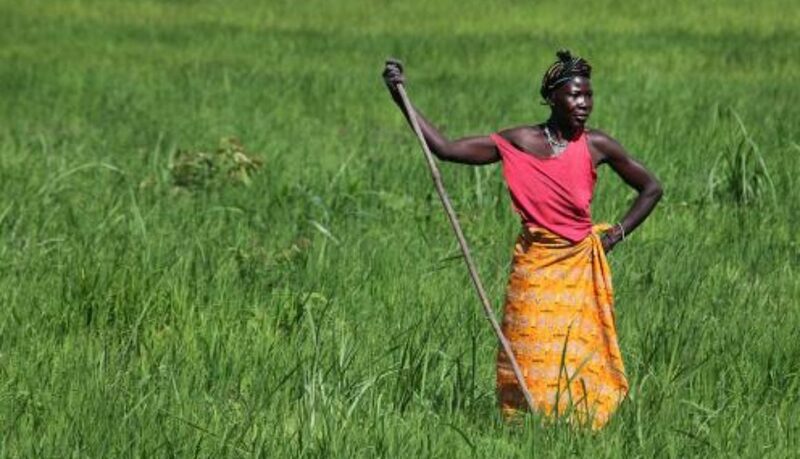 The fact is, for the vast majority of the world’s population, social and cultural views on gender norms and roles devalue and denigrate women and girls, and undermine and restrict their social status, livelihood opportunities, behaviours and freedoms. These same norms encourage excessive risk taking behaviour among boys and men which has negative consequences for their health outcomes too. It is well documented the health service provision itself is not gender neutral and can exacerbate or alleviate gender inequities. By identifying what’s required in a gender equitable health system, and making those changes, health system reform can contribute to a foundation of gender equality. But how will states implement these changes without clear guidance or incentives to implement gender sensitive reforms? Our paper argues that given the opportunities for implementing change during the post-conflict period, and the importance of gender equality to broader social well-being. It is time for policy makers, advocates and researchers to investigate and establish much-needed policies, guidance and indicators required to ‘build back better’. The paper is part of a wider report that was commissioned by the Stockholm International Peace Research Institute (SIPRI) on the opportunities and challenges of building gender sensitive health systems in post conflict contexts. The report was also a joint output from the ReBUILD project: re-building health systems in post conflict states in Cambodia, Sierra Leone, Uganda and Zimbabwe, funded by the UK Department for International Development (DFID). Views represented in this blog are not necessarily those of DFID. If you would like to be part of this debate you can join the Working Group on Health Systems in Fragile and Conflict Affected States which is part of Health Systems Global.